A rugged take on the court staple. In preparation for the Fall/Winter season, Jordan Brand put together a familiar “Wheat” colorway for its rugged Air Jordan 9 Boot NRG model. Drawing elements from Nike‘s Special Field Boot, the hybrid shoe outfits the court classic Air Jordan 9 with a clean nubuck upper, accented by trail style metal eyelets and cord laces. Branding on the tongue and heel of the shoe is done in a matching “Wheat” color to continue the tonal theme of the colorway. Finishing up the design of the shoe is a chunky gum rubber outsole with an exaggerated spike tread from toe to heel — for those slippery weather conditions to come. 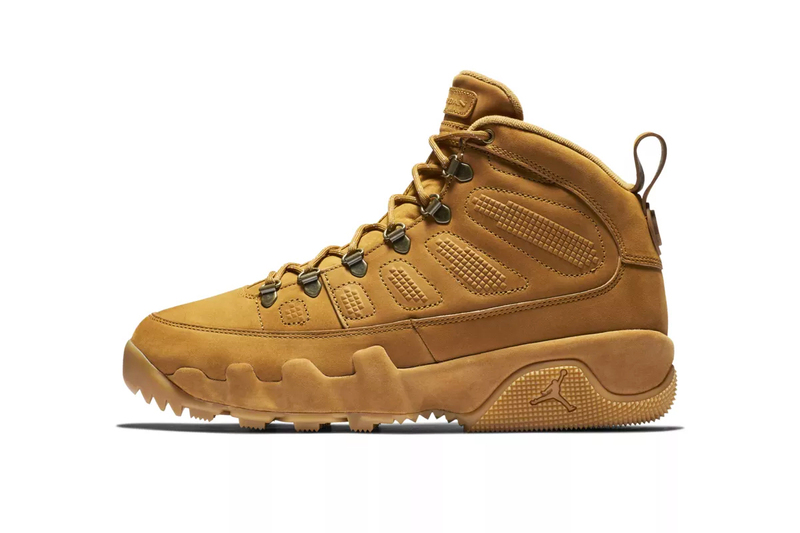 Priced at $225 USD, the Air Jordan 9 Boot NRD “Wheat” is set to release online and at Nike Sportswear on October 17. For more Jordan Brand news, the Air Jordan 1 Moto recently received the “Bred” treatment. Highlighting the famous garment label. For retro Nike Sportswear fans. A solo exhibition of new works. FILA's Disruptor Satin Low Takes a Dip in "Atlantic Deep"
In the “Queen Daenerys” colorway.